FileFinder Anywhere is like the “Rolls-Royce of recruitment systems”. If executive recruitment is at the heart of what you do, it’s a perfect fit – and this is why we are using it. My first experience as an executive search consultant was at Boyden, and that’s where I discovered FileFinder. It was the first executive search software that I ever used, back in 2000. Obviously since then FileFinder has evolved. At that time, it was much less integrated with external applications than it is now. But it was already a powerful tool that helped us identify very precisely potential candidates in many different ways. It wasn’t just a database. It was specifically designed for executive search. FileFinder lets you manage your search assignments as full projects, which should sound obvious but is not always the case. After Boyden, I joined Hays to contribute to the development of Hays Executive. I quickly realised and communicated that launching a search division would require a completely different approach to their usual recruitment processes, with a new distinct methodology – and therefore a new tool would be necessary to support this. 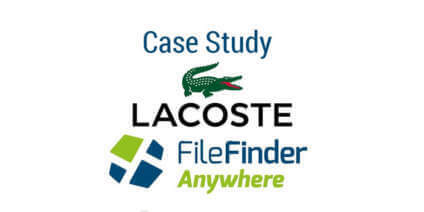 I recommended FileFinder as I had full confidence in the tool itself, which revolutionized the way things were being done and allowed the new executive search division to attune newer and more specialized work processes. My first experience in Talent Acquisition was in 2014 at Ipsen, a pharma company that was starting its own in-house recruiting practice – we also implemented FileFinder there. In September 2015, I moved to Lacoste to work on a similar project: building a Talent Acquisition function and implementing new methodologies, processes, internal mobility, employer branding and of course new tools to support the new function. I have to enable a global way to manage systems and processes and to standardize our recruitment across various departments. When I joined, one of the most important things for me was to be able to report quickly not only on my search assignments, but also all other desk activities. So I requested a platform that would allow me to do that very quickly. I needed a tool that would let me work beyond Outlook, and to be able to capitalize on the information generated by my own research in the future. I needed to find and access very rapidly all our recruitment data and centralised documents, and also to be able to establish standardized work processes. With FileFinder, I can look up and find all the required information or share it at any time with anyone else. As well as managing search assignments, it is essential for knowledge management and to keep a historical track of all our work. Our system is very stable and the training I received was very clear. Immediately after the training, I could customize FileFinder to fit my needs – no problem at all and it’s very easy to do. I would not hesitate for a second to recommend FileFinder Anywhere to other organizations looking for a tool to manage their Talent Acquisition operations. It’s like the “Rolls-Royce of recruitment systems”. If executive recruitment is at the heart of what you do, it’s a perfect fit – and this is why we are using it.